A Neolithic polished flint axehead. Neolithic polished flint axe, broken at cutting edge. Drawn T. H. McClough (NAU) 1971, (S1). 200 yds north of St. Michael's Church. --- Archive: Clarke, R. R. and NCM Staff. 1933-1973. Norwich Castle Museum Record Card - Neolithic. Barton Turf. <S1> Illustration: Clough, T.. 1971. 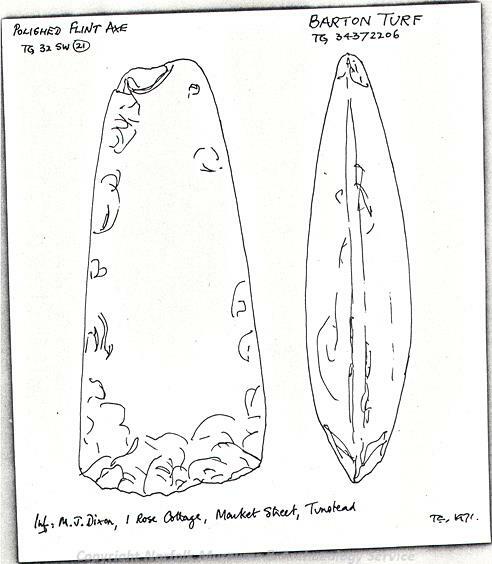 Drawing of a Neolithic polished flint axehead.. Card. 1:1.